Need a quick and tasty dish to satisfy your family? 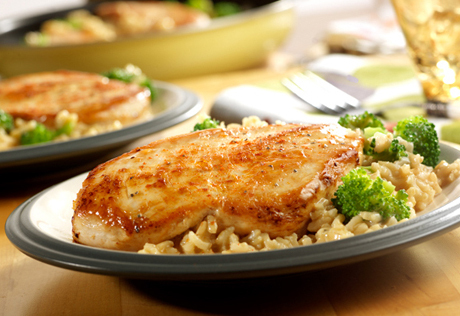 This easy skillet supper featuring chicken, broccoli and brown rice simmering in a creamy sauce is ready in a snap and absolutely scrumptious. Stir the rice and broccoli in the skillet. Reduce the heat to low. Return the chicken to the skillet. Sprinkle the chicken with additional paprika and black pepper. Cover and cook for 5 minutes or until the chicken is cooked through and the rice is tender. Recipe Note: Cooking times vary. To ensure best results, use instant whole grain brown rice. Serving Suggestion: For dessert serve chocolate chip cookies. The hubby and I have recently decided we're going to eat healthier, which means very little red meat and NO white rice. During my looking for healthy recipes I came across this one. Looked good so we'll give it a shot. Got it all started and figured out that the only two cans of cream soup of any kind I have are way out of date. So.... I had to make my own in a quick hurry. Chicken broth, butter, mayo (no milk in house) and seasonings. Currently waiting for the last few minutes of cook time. I'll post an update as to wether or not my "cream soup" worked. Make sure you season when it says or like me you will burn the paprika to the bottom of the pan and make a mess of your rice. It did turn out nice and filling I just have to do better next time. I've been experimenting with this recipe since I first made it. Over time I've done different things with it. Instead of water I use chicken broth to add more flavor. Sometime I don't want to cook the chicken so I use the already cooked grilled chicken breast strips. And for the brown rice, I've used the Asian brown rice for a nutty texture and flavor. I almost think I butchered the original recipe, but I enjoy cooking and seeing what else works. In Louisiana we like our food spicy, so I sprinkled Creole seasoning on the chicken before browning and followed the remaining directions. It was fantastic and very easy. This dish was really good... the only complaint we had was the rice was bland. Next time I think I'll try using one of the flavored rice boxes (like rice pilaf orPparmesean rice mix), or try adding some spices to the rice. It's definitely worth making again.